Watch: Did DDLJ’s ‘palat’ scene make it to Game of Thrones season 8? In the iconic scene, Raj (Khan) can be heard saying,"Raj, agar yeh tujhe pyaar karti hai, toh yeh palat ke dekhegi... palat....palat. (If she is in loves with me, then she is going to turn around.)" A creative mind edited the intense scene between Euron Greyjoy and Cersei Lannister and replaced it with the iconic dialogue from the movie Dilwale Dulhania Le Jayenge. Ever wondered what a mash-up of popular fantasy drama Game of Thrones and Shah Rukh Khan’s Dilwale Dulhania Le Jayenge would look like? Wait no more. 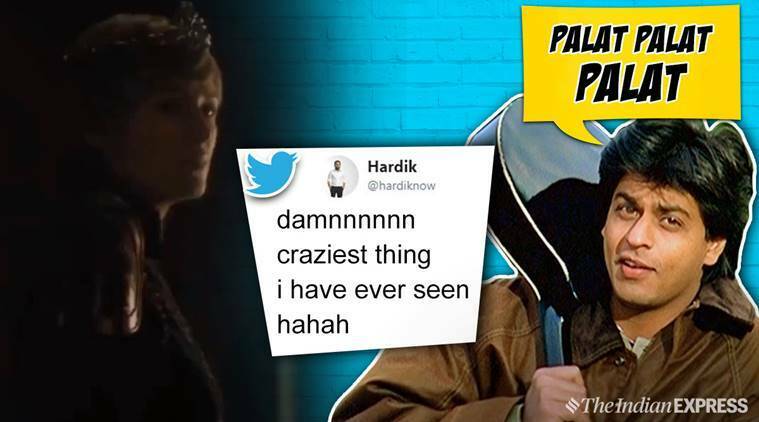 A video of a hilarious spoof of a scene from the first episode of season 8 has gone viral on social media and it is sure to leave you ROFL-ing! As expected, it did not take long for the video to go viral, with many left amused.